Matilde | Chicago's Pipe, Cigar & Tobacco Store | Iwan Ries & Co. The new cigar is comprised of Dominican and Nicaraguan filler tobaccos beneath a Dominican binder and finished with specially selected Ecuadorian Habano wrapper leaves, which are cut in a specific manner to optimize burn and appearance. 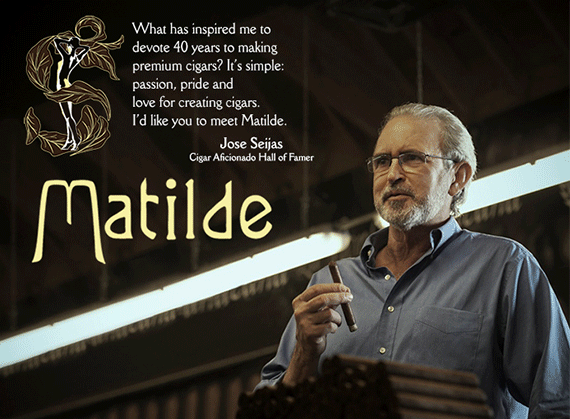 Matilde is produced at Seijas’ La Romana factory in the D.R., which employs only a small number of rollers. The factory was established last year to support Seijas’ new “New World Cigars” venture, a company created to provide a cigar destination for the busy tourist trade in La Romana, which is located in the southeastern Dominican Republic about four hours away from Dominican cigarmaking capitol Santiago. One unique characteristic of the factory, which has been dubbed “Tabacalera La Matilde,” is that all of its rollers are also cigar-smokers with hands-on product knowledge, a mandate introduced by the senior Seijas in order to ensure a superior end product.